I really don't have to do much to prove that I am being harassed, stalked and attacked. The evidence is overwhelming. Unfortunately, this abuse is effecting others as well. I was just forwarded some disturbing and threatening emails from a friend on Twitter. 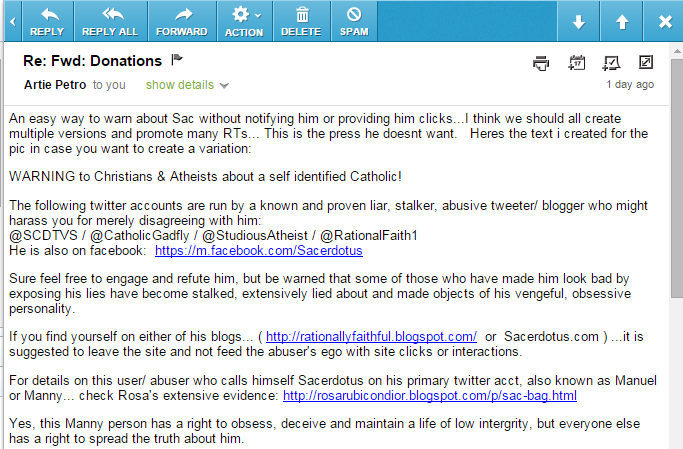 In the emails, the person behind the account @FreeAtheism who goes by "Artie" sent three threatening emails exhibiting cyber stalking/bullying & extortion to Catholicgadfly blackmailing him to meet his terms or he will post some image he made recycling the lies "Rosa Rubicondior" and others have posted. The emails are clearly criminal and I advised Catholicgadfly to report them to his local police. I also ask my readers and friends to notify Clermont Police. This person is obviously not well in the head and if he is capable of blackmailing someone due to his emotional distress, then he is capable of any other harm. If you are in Clermont or are a police officer in the area, please do not hesitate to contact me. I will cooperate with any investigation as I am morally and legally required to do so.